First Look: TOM HARDY as "BANE" in [BATMAN: THE DARK KNIGHT RISES]! Today we have the very first official look at Tom Hardy as "Bane" in Christopher Nolan's The Dark Knight Rises, the image comes via the launch of the movie's website. The Dark Knight Rises stars Christian Bale, Anne Hathaway, Joseph Gordon-Levitt, Tom Hardy, Gary Oldman, Morgan Freeman, Marion Cotillard, Josh Pence, Nestor Carbonell, & Michael Caine, and hits theaters July 20th 2012. Hit the jump to see the full image. Launched this morning, the website is presently a blank, black webpage underscored with a recording of men chanting in an unknown language. A spectrograph analysis of the audio conducted by SuperheroHype readers revealed a hidden message, "#thefirerises," obviously a Twitter hash tag. 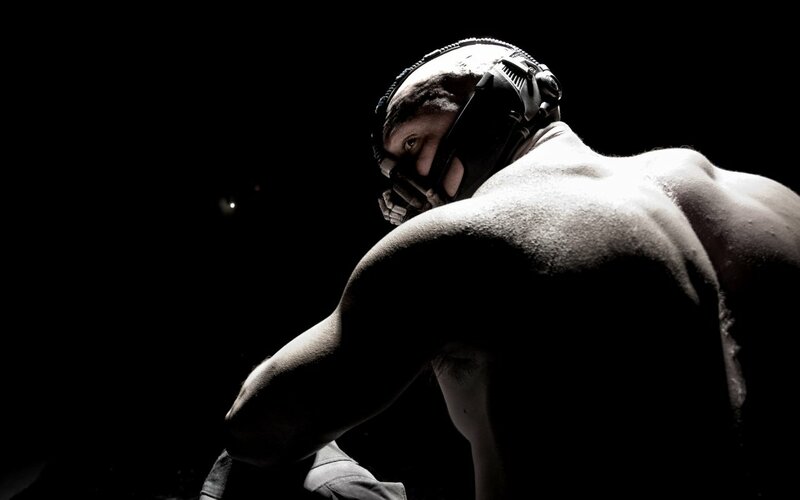 Tweeting the hash tag generated a reply from the @TheFireRises Twitter account with a link to another page on the Dark Knight Rises website where a mechanism plugs users' Twitter profile pics into a mosaic that within a matter of hours formed a clear photograph of Bane. I'm reading: First Look: TOM HARDY as "BANE" in [BATMAN: THE DARK KNIGHT RISES]!Tweet this!